Hempel Primer Undercoat is a quick drying undercoat for single component gloss enamel paints that gives excellent durability and surface stability for use above the waterline. 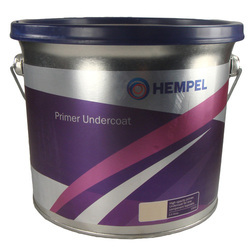 Hempel Primer Undercoat is ideal for use with Hempel Brilliant Gloss marine enamel paint. Hempel/Blakes Primer Undercoat is a single component primer for all substrates (including steel) above the waterline (use Hempel/Blakes Unerwater Primer for below waterline priming) that is a quick drying, high-opacity primer and undercoat that gives excellent durability and surface stability ready for overcoating with single component topcoats. Primer undercoat helps to provide a more resistant contact for enamel paint to prepared surfaces. The tough flexible resins are long lasting, easy to apply and rub down, giving a smooth base for the finishing coat. Excellent obliteration allows for easy colour changing.